I’ve had a number of technological nightmares with the latest being a computer that doesn’t know what to do with .exe files. If you don’t know about computers, then suffice it to say that that’s BAD. If you speak Geek, then you know just how bad it is. And exhausting. So, to ease myself back into this blogging thingo, and to help ease any withdrawal symptoms you may have been having (Nawww! ), I’m going to give you something that is about as simple as it gets. Porridge. Microwaved porridge to be more specific. Now I know it’s starting to warm up here in the antipodes, but some of the mornings have enough of a chill about them to still warrant a heartier, tummy-warming breakfast. In the Northern Hemisphere, Autumn has started and nothing more needs to be said. So I’ll write a bit instead. 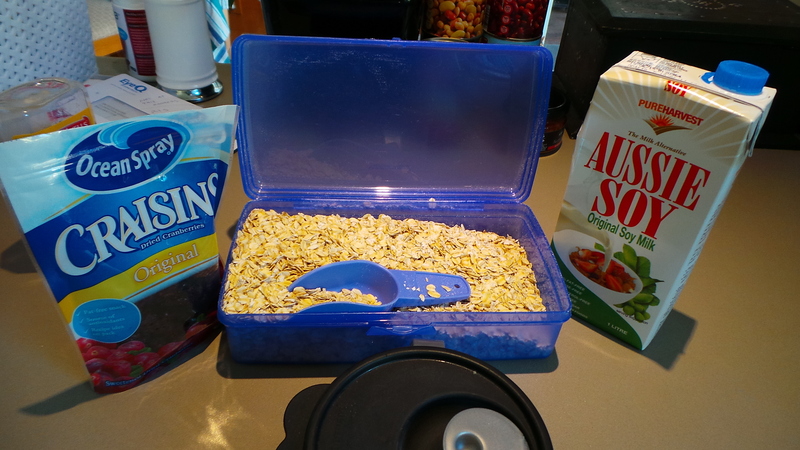 During the $30 Challenge, Porridge formed our staple breakfast. It’s quick, inexpensive, nutritious, fibre-laden and filling. Many years ago, Uncle Toby’s made boxes of porridge with little sachets of different flavoured porridges. My favourite in the box was the apricot and wheat one – then they discontinued it. They kept making the product, but not with that flavour. So I thought I’d make my own. It was then that I realised just how much more I had been paying for a tiny bit of convenience. Really, with a little planning, it is much better to make your own. Get yourself a packet of Rolled Oats. Not Minute Oats, but Traditional Rolled Oats. Then buy some dried fruit. This could be whatever you like; I started with diced, dried apricots and then Craisins came on the market so I used those too. You could use sultanas, dried apples, dried cherries, acai or goji berries if you have a hipster bent… It’s your meal, experiment, find your bliss. You’ll also need liquid of some kind, be it cow’s milk, soy milk, almond milk or even water if you prefer. I bought myself a couple of hinged lunch boxes, like the one in the photo above, and keep my oats in one and my fruit in the other. The hinged lids saved a lot of fumbling in my sleep-addled work day mornings. They aren’t strictly necessary, but they make life more comfortable. A small scoop lives in the oat box. The one pictured was a Tupperware party favour many years ago but, for something around the same size, try saving (and washing thoroughly) the little scoop you get in boxes of laundry powder. I use two scoops per serve. Or make your porridge in a microwaveable bowl covered with a splash screen of some kind. You could use a piece of paper towel, but clear, plastic, reuseable ones can be bought for a dollar or so in most variety stores and supermarkets and will save you money in the long run. So here goes. Pay attention, or you’ll miss something important. First, place your oats into your mug/bowl/whatever. Use about 1/3 to 1/2 a cup. 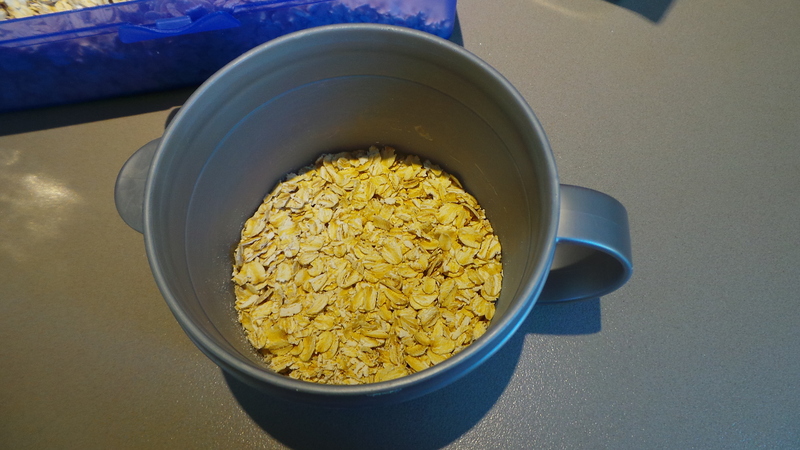 1/2 to 1/3 cup of rolled oats. Then add whatever dried fruit you like. This is purely optional, but it does add colour, texture, flavour and sweetness – and makes it yours. You only need a pinch or so, not a huge amount. This photo shows the entire amount of fruit added. 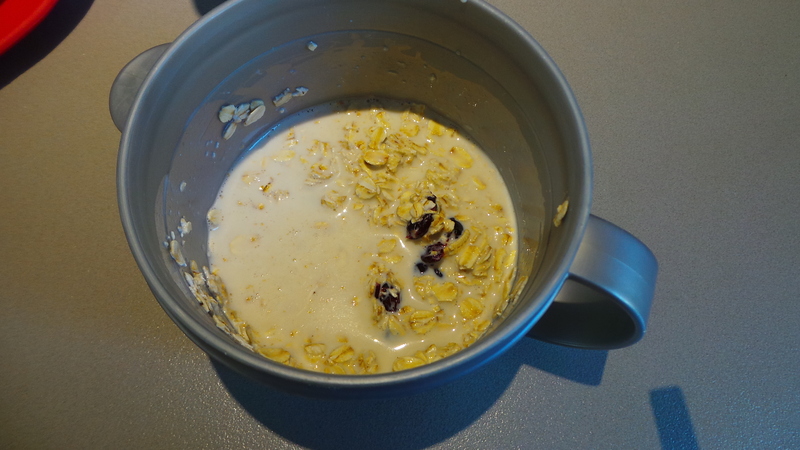 Add just enough liquid to cover the oats, stir, cover the dish and microwave at 80% power for one minute. Add your milk, stir, cover and nuke. Remove from the oven, stir, add a little more milk and repeat the 80% power for one minute stage. If your oats boil over – and this is a definite possibility – try again with either a lower power setting or shorter time. 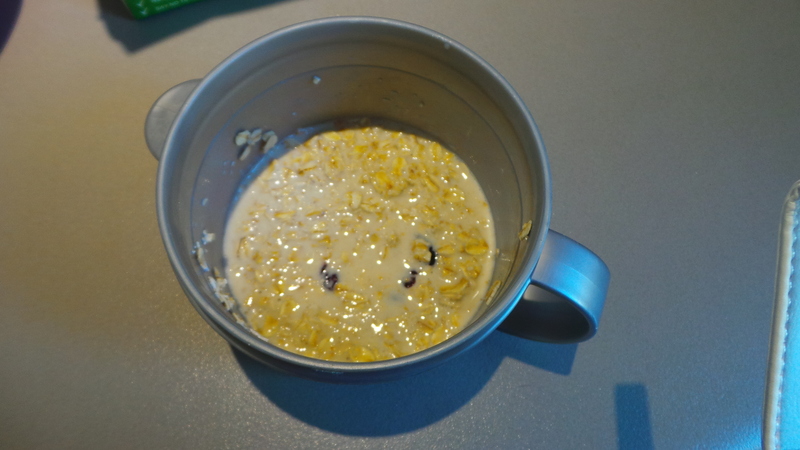 Don’t skip adding the second bit of liquid as it will help to reduce the temperature and the risk of porridge volcanoes. The oats will continue to absorb liquid and become creamier on standing. I used to make my oats and morning cup of tea, then shower. By the time I’d done that, both had cooled sufficiently to consume. Feel free to add more liquid, stirring well, and some sweetener of your choice; honey, golden syrup or maple syrup work well, as does sugar of any kind – just don’t overdo it. After you’ve finished, I would suggest filling your container with water before you rush out the door. It will be much, MUCH easier to wash when you get home in the evening. Trust me. If you wish to up the fibre content for any reason and you can afford it, try adding a tablespoon or so of chia to the mix. It will absorb a lot more liquid though, so be sure to compensate. You could also just pop all the dry ingredients into your sealed soup mug and cook them up in the office if you are really pressed for time. Just remember to bring your mug home for tomorrow’s fast breaker! Better yet, the amount of money that will buy you a box of sachets for 8 meals, will buy you the ingredients for several more weeks worth of home-compiled breakfasts that you can tailor to your preferences. 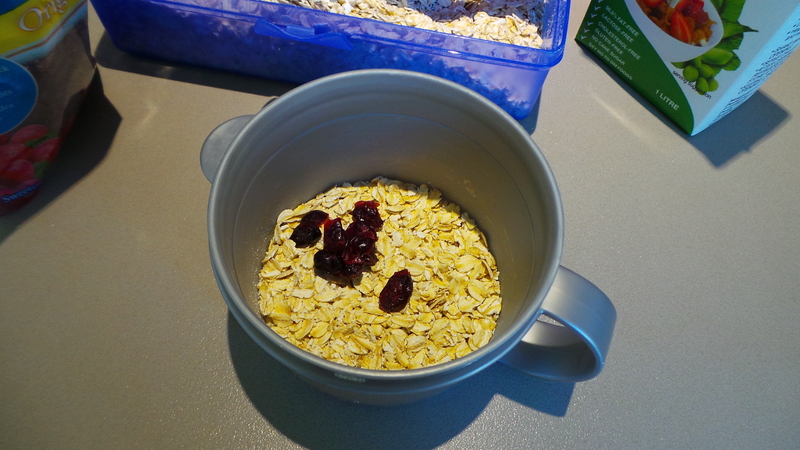 And give you oats and dried fruit for other goodies like Anzac Biscuits and Apple Crumble.